These crunchy baguettes feature a chewy interior riddled with holes, and a crisp, deep-gold crust. While it's a challenge to make "real" baguettes at home, this version is probably as close to an artisan bakery version as you're going to find. The ingredients in baguettes are pure simplicity: flour, water, salt, and yeast. It's the baker's technique that turns an average baguette into an all-star. Don't expect perfection the first time out, but the more you practice your baguette-baking techniques, the better the baguette you'll make. Our guarantee: These baguettes, right out of the oven, will have a crunchy crust; later, the crust will become chewy. They'll be a deep golden brown, about 16" long, and 1 3/4" to 2 1/2" in diameter. Place the logs seam-side down onto a lightly greased or parchment-lined sheet pan or pans; or into the folds of a heavily floured cotton dish towel (or couche). Cover them with lightly greased plastic wrap, and allow the loaves to rise until they're slightly puffy ("marshmallow-y" is the term we use in our baking school). The loaves should certainly look lighter and less dense than when you first shaped them, but won't be anywhere near doubled in bulk. This should take about 45 minutes to an hour at room temperature (about 68°F). 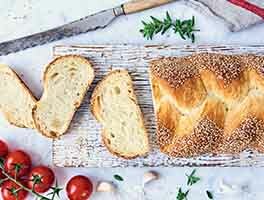 We recommend our unbleached all-purpose flour for this recipe, as its protein level and other attributes closely mimic the flour used by French bread bakers. Feel free to use unbleached bread flour, if you like; there's no need to adjust the amount of liquid, the dough will simply be a bit stiffer. 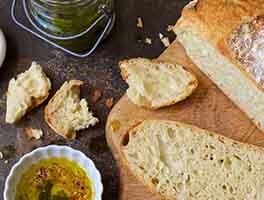 A long, slow rise is an excellent way to develop flavor in simple breads like this baguette. As yeast grows, it releases organic acids and alcohol, both of which are flavor carriers. If desired, reduce the yeast in the dough to 1 teaspoon and allow the dough to rise for 3 hours (rather than 90 minutes) at cool room temperature (around 68°F). Gently deflate the dough, fold it into the center, and turn it over after 1 hour, and again after 2 hours. To make demi baguettes: Divide the dough into 6 pieces. Shape each piece as you would for a classic baguette, rolling them into 7" to 8" long loaves. Bake baguettes in a three-well baguette pan, if desired. 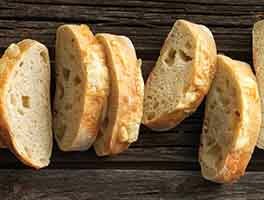 To bake baguettes in a stoneware baguette baker: Divide the dough into four pieces. Shape each piece as you would for a classic baguette, rolling them into 12"-long loaves. To make an épi de blé, a slightly longer and more slender loaf that bears resemblance to its namesake sheaf of wheat: Divide the dough into 3 pieces. Shape each piece as you would for a classic baguette. Hold a pair of scissors at a low angle at one end of the loaf and open the scissors so they're wider than the width of the bread. Make a swift, clean cut 3/4 of the way into the dough, moving the cut piece to one side of the loaf. Repeat the process 2" to 3" farther down the loaf, moving the newly cut piece to the opposite side of the loaf from the first. Continue doing this until you reach the other end of the loaf. Note: the farther you cut into the loaf, the more elegant, though fragile, your épi de blé will be. Want to make baked stuffed baguette sandwiches? See full instructions in our blog. I only wish there were a video to show the shaping process as I have never shaped baguettes before and reading the process was not very much help to me. However, the baguettes turned out deliciously chewy on the inside, crispy on the outside, and a gorgeous golden brown! I also had to use AP flour as I hadn't ordered bread flour yet and they still turned out wonderful. 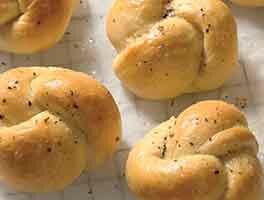 I cannot wait to make them again but with the proper flour. Thank you, King Arthur for your recipes and your baking support! I'm only giving four stars because I think some of the instructions regarding the risings and kneading could be more clear. My three loaves came out with a nice crispy brown crust and an airy center, so success! Not having a super accurate scale, I erred a little light on the flour, I think. The rise is a little different from my whole wheat bread and the dough remained a little gummy right through to putting it in the oven. Can't argue with the results, though. This was my first ever try at baguettes and they turned out amazing! Thank you KAF! I have a steam convection oven and a bake/convection oven. 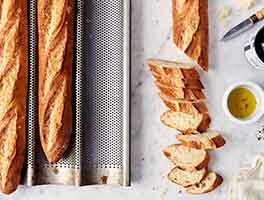 What is the best oven environment for baguettes? First time attemp and it was successful done. Thank you !! Second time making this recipe today. The baguettes keep getting better! I love this recipe! First attempt at bread making. I have to say, I have never tried a King Arthur recipe I didn't love. 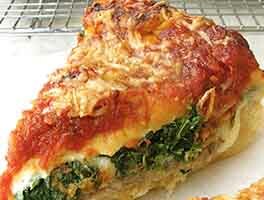 I just have one question, can I substitute your French style flour for this recipe? I first baked the bread in 2016. I lelf one loaf in the oven after baking as suggested. It really made a difference in color and crispness. Maybe this would help Paul in Bend, Oregon.